These gates are activated by a simple push-button, which opens gate(s) for entry. It does not detect forklift traffic, but helps employees cross at designated areas while slowing them and forcing them to pay more attention to traffic in the area. To enhance protection, high-visibility boom arms are installed in the forklift aisle to help alert drivers of pedestrian traffic in the area. The arms synchronize to open and close with automated or manual pedestrian gates. The U.S. Department of Labor says about 100 workers are killed and another 20,000 are injured every year by forklifts in the U.S. alone, so safety is always a concern whenever forklifts and people operate in the same space. 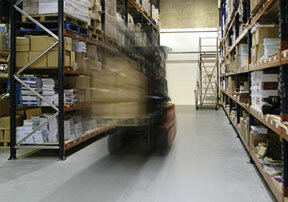 This happens frequently in most warehouses, shops, factories, distribution centers, or lumber yards. Proactive companies are taking measures to reduce forklift injuries. Given the size and weight of forklifts, it becomes vital to control the flow of pedestrian and equipment traffic in any operation. Dangerous or blind intersections where visibility may be limited, such as high speed doors, or very high traffic areas are where traffic control gates are most highly recommended. When properly utilized, these gates can reduce the possibility of pedestrian traffic coming into contact with fork lift traffic. AisleCop® can be configured to cross an aisle, to guard a dangerous door entry to a warehouse, to help protect workers during critical service times (such as at robotic cell restocking). Any blind, limited vision, or heavy traffic forklift area can be outfitted with safety systems in virtually any configuration, with any mixture of pedestrian and forklift gates to suit the application. Before shipping, your system will be set up in our facility and tested for proper functionality.